Timewatch®, specialists in Professional Services software solutions.  Timewatch are specialists in Professional Services Software solutions. From simple and easy to use timesheet and time recording solutions, to outlook time tracking and outlook timesheet entry systems, employee and resource scheduling, time recording and project time and billing. Timewatch time recording and invoicing systems combined with employee scheduling provides a complete professional services automation sollution (PSA) which is available as a cloud based solution. or complete PSA, Professional Services Automation Solutions(PSA) which provide timesheets and expense sheets for time tracking and expense tracking, time and billing, resource scheduling and time reporting in both hosted SaaS and on-premises solutions. Timewatch Customer Services ensures your chosen PSA solution is implemented in the best possible way for your services organization. Our solutions are fully scalable from small to medium enterprises (SME) to large international organizations, see here for an overview of our products. Resource Scheduling Solutions include our WhiteSpace and Wallchart products, as well as Time&Space or TimeAndSpace which include resource scheduling as well as time tracking and billing to form a complete Professional Services Automation Solution. New for 2011 is our amazing new Schedule Time Resource Scheduling plug-in for Outlook / Exchange implementations which adds skills scheduling to Outlook. Review the timewatch time tracking, time reporting, timesheet, expenses entry, time & billing, time recording and invoicing, time and billing, resource scheduling and project management solutions, review pricing then if you like what you see, request a test drive. You can compare Timewatch Professional Services (PSA) Solutions as well as our Resource Scheduling solutions here. Time Management systems including Time Recording details all time recording and timesheet entry options including web browser timesheet entry and pda timesheet entry . Time & Billing focuses on Time Recording and Time and Materials Billing options with fixed fee time and expenses available to organizations that wish to integrate time tracking and expenses entry with billing to invoice Customers. The Financials section lists all of the financial accounting systems that can be integrated with Time Recording and Billing and provides an overview of some of the more common systems including Sage, SunSystems, Coda-Dream, Microsoft Great Plains Dynamics as well as many others. The Project Management section shows how to unleash the power of Microsoft Project 98, 2000 & 2002 by integrating with Time®. Project Managers still plan projects in MS Project which is seamlessly integrated with the Time® time tracking software, allowing users to enter timesheets for example via web timesheet or which are automatically available within MS Project. More details and on-line demonstrations can be found on the Project Management Solutions Site. Fully intetgrated MS-Project Timesheet system from Timewatch, seamlessly incorporates time recording functionality within Microsoft Project 98, 2000 and 2003 to provide total Project Management Solutions. Job Costing Software for a wide range of Customer sizes and Industry types. See how Job Costing Timesheet entry users enter timesheets. Powerful Resource Scheduling and resource management, schedules resources from employees & staff to meeting rooms, conferences, training courses and equipment. Also see the Resource Scheduling site for full details on scheduling resources and in the UK, see Resource Scheduling Solutions UK. Excellent Project Resource Scheduling Solutions and Scheduling Software to assist Project Management and Project Scheduling Solutions. Based around specific Project Views, the WhiteSpace®, Project Resource Scheduling can be integrated with MS-Project as well as the Time Recording, Timesheet and Time Tracking Solutions for Time and Billing. The Time® range of Time Recording Software supports a range of time recording and timesheet entry clients including networked, remote, on-line off-line, web timesheet entry, browser, internet and intranet time recording. Also see the Time Recording Software site, and if you are in the UK or Europe, visit the UK Time Recording Software site. For friendly and easy to use Time Tracking software to track time on any project. Also see the Time Tracking area for simple, easy to use time tracking software and timesheets to help you track time more easily, and if you are in the UK or Europe, visit the Time Tracking site, the UK Time Tracking Software site and the time tracking solutions site. Timewatch® are premium providers of cloud and on-premises professional services solutions, including time recording, Outlook timesheet entry and time tracking, project costing, resource scheduling and billing. Friendly, easy to use, yet highly configurable timesheet entry and time management software with powerful administration, reporting and analysis facilities. Available as a cloud or on-premises solution. Outlook timesheet entry system saves employees valuable time every day by converting their Outlook appointments into timesheets. Supplied with a web admin tool for setup, management and reporting as well as the OutlookTime plugin for Outlook 2007 and 2010. Also available as an add-on for any of our other time recording products and may even be able to be interfaced with your existing timesheet system. Provides all of the time recording facilities of Time® with added project disbursement entry, time costing, charging and advanced reporting functionality. Optional billing and Outlook timesheet entry modules available. Available as a cloud or on-premises solution. Highly successful on-premises time recording solution, project costing, charging, billing and advanced reporting solution with a pedigree of over 20 years and a staggering customerbase. CentralTime® is highly scalable and customizable, yes customizable, it is a time & billing solution first and foremost, but almost every aspect can be customized to service your needs - fields, menus, business processes, interfaces. Flexible, cloud based professional services solution offering the best of Time®, Time®&Money & WhiteSpace® in a single, browser based Solution where you choose the modules you need, and access it as a hosted SaaS solution via your browser. A dream come true for Outlook users, converts appointments into timesheets at the click of a button and runs with both Time® and Time®&Money. Configurable windows Resource Scheduling Solution with Web option.